A domain name registrar was an end user this week. It’s not often that you see a domain name registrar acquire a domain name as an end user. But that happened this week as Uniregistry (or is it now Uni?) bought the domain name UniEmail.com at Sedo. This was one of 19 end user sales I uncovered at Sedo for the past week. One that I didn’t include because I don’t know the buyer is Club.app. It sold for just $2,000, which sets a value point for .app domains. Here’s the list of end user sales from the past week. You can view previous lists like this here. Lootjes.nl €29,500 – Forwards to Lootjestrekken.nl. This site lets you set up gift exchanges by pulling straws. It randomizes who your gift recipient is. Capiche.com – A fun name but it reminds me of the spelling challenges that Gazoontite experienced back in the day. I’m not sure who bought it but the domain resolves to a page with a Capiche logo. AutoPiter.com €9,900 – Forwards to AutoPiter.ru, a Russian auto and motorcycle parts dealer. Chacon.com €9,850 – Chacon sells smart home goods and cameras at Chacon.be. It now has the .com to match its country code domain. I think it got a good deal on this name. InversorGlobal.com $6,000 – This domain was purchased by Inversor Global, a Spanish Investment Firm that currently uses IGDigital.com as its main website. Lyst.ch and Lyst.at €5,500 each – Lyst Ltd is an online fashion store that uses the domain name Lyst.com. OmniGym.com $5,465 – Omnigym (Puuha Sports Oy) produces home fitness and gym equipment out of Finland. CloudTechSolutions.com $4,999 – Cloud Technology Solutions is a Google Cloud Premier Partner that provides G Suite and Google Cloud Platform (GCP) solutions. The domain forwards to CloudSolutions.co.uk. EYUP.com $3,900 – David Richards of the David and Jane Richards Family Foundation, a charitable organization whose goal is to educate, empower and improve the lives of children. For now, the domain forwards to the foundation’s website at djrff.org. QAD.nl €2,900 – Forwards to QAD.com, an integrated business software company for manufacturing companies. The company now owns the Dutch ccTLD. WER.io $2,800 – A new digital marketing agency whose claim is to connect the physical store aspect of businesses with digital channels, enabling an immersive, spatial computing environment and direct marketing channel between brands and consumers at the local store and online. ChefsResource.com $2,500 – This website is still being developed but has the message posted, “We are trusted by millions of home cooks as the authority for best recipes, cooking tips, and much more”. Might be some hyperbole there since it’s a fresh install of WordPress. LQ.be €2,200 – Lemmis Q is a French Consultancy Firm that helps organizations through structural changes using their own readiness scan based on the “Six batteries of change”. Its website is LemmisQ.com. Viak.com – $3,500 Viak is an organization trying to make smartphones more affordable. UniEmail.com $3,000 – Domain name registrar Uni (aka Uniregistry) bought this domain. Arcade.one $3,000- This new site appears to be for games and has a cool coming soon page. George.pro – €2,019 Erste Group’s George Labs, which has a banking solution called George. RenewalTherapy.org $2,000 – Forwards to RenewalCounselling.com – an individual counseling and psychotherapy services provider. New Cayman Islands law forces Uniregistry to change Whois policy. Domain name registrar Uniregistry is making the publication of Whois data opt-in for registrants. The move is in response to a new Cayman Islands Data Protection Law. Think of it as the Cayman Islands’ version of the EU’s General Data Protection Regulation. Many of Uniregistry’s clients are domain name investors who want their information disclosed in Whois and they will be able to opt-in to doing this. Technically, ICANN requires all registrars to provide a way for their customers to opt-in to have their information published in Whois but few have enabled this capability. For domains with masked Whois records, Uniregistry will provide a form for people to contact the domain owner. Most (but not all) other big domain name registrars began masking Whois data carte blanche after GDPR went into effect in May even though the law doesn’t cover non-EU citizen/resident data. Customers have until the end of March to use Topcoin at Uniregistry. Domain name registrar Uniregistry is dropping Topcoin from its platform. The company announced the change in an email sent just before midnight Friday night. Topcoin is a blockchain-based digital rewards system. It is designed as a rewards program for customers of digital goods such as domain names and web hosting. Uniregistry is the only major company I’m aware of that joined the program, and Uniregistry founder Frank Schilling was directly involved with Topcoin. Customers were often frustrated by Topcoin, however. Uniregistry distributed the reward cryptocurrency when customers purchased products but it was difficult to redeem Topcoin. Each coin essentially had dollar parity at Uniregistry but could only be used for part of the purchase. Customers with the highest discount rates at Uniregistry couldn’t redeem Topcoin at all. Ironically, now that Uniregistry is raising prices for anyone that doesn’t opt into its paid discount plans, it’s possible that people will be able to use their Topcoin. They have until the end of March to redeem Topcoin at Uniregistry before the registrar stops accepting it. The Topcoin.com website changed yesterday or today to note that it is undergoing maintenance. A Topcoin representative told DNW that it is working on getting more partners where people will be able to spend Topcoin, as well as restore the ability to access Topcoin through the Topcoin.com website. Domain name registrar changes to shorter name. Frank Schilling’s Uniregistry has changed its brand name to simply Uni. The move coincided with the launch of a new app last week that makes it easy for users to get email or create a website. 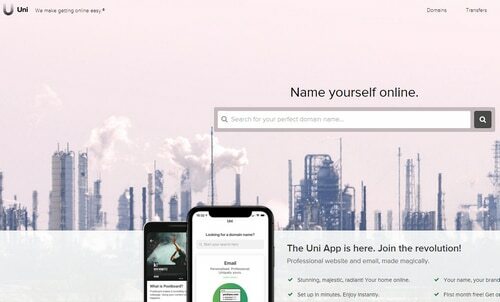 On November 28, the company filed a trademark application with the U.S. Patent and Trademark Office for Uni for several services including domain names, email and web hosting. Intriguingly for a domain name company, it does not own Uni.com. That domain is owned by an Italian non-profit. For now, the website is still at Uniregistry.com. While the logo on Uniregistry.com has changed to Uni, you’ll still find references to Uniregistry throughout the site and in emails the company sends. New dashboard provides at-a-glance view of sales. Uniregistry has added a new dashboard feature to its market. The dashboard shows data from the past month, recent sales inquiries, and sales. It looks somewhat similar to the Afternic dashboard. Previously, when you visited the market you went straight to the inbox of offers. I don’t sell many domains through Uniregistry’s market, although I have sent a few inquiries directly to Uniregistry’s brokers this month to see how they handle them. Compared to Afternic, you get a lot more insight into the broker’s interactions with the potential buyer. You can view all of the emails between the parties and see a log of when the broker called the buyer. This adds accountability to the broker, although I will admit it’s frustrating when inquiries aren’t responded to the same day.